This week was a hard week on our farm. My son took a hard hit when 3 of his top producing and favored ewes suddenly became very sick and died within a matter of 24 to 48 hours of going down. It was very sudden and unexpected and very difficult for a 15 year old to grapple with all the whys. We are currently in lambing season. Each year around this time, we anxiously watch and wait for lambs to drop on the ground. Most of the time it is kinda like Christmas. You wake up in the morning and go outside to see if there are any little lambs bouncing around the field. The day finally comes when the lambs start showing up. It’s exciting to hear the loud proclamations of “Baby lambs!” come through the back door as one or more of the boys enter the house from morning chores shouting the new farm news of the day. That is better than shouting “so and so is missing” or “so and so chicken got killed by a possum and its head is gone” or “Dixie is in heat. Spanky is mounting her!”. Sometimes the farm offers way to much information to 10 year olds who don’t know which conversations to hold off on until after breakfast and after your mother is out of the room. Usually lambing season goes off flawless except for the times that it doesn’t. There was the time we tried to do lamb surgery and save a lamb who was prolapsing his intestines through the umbilical cord. 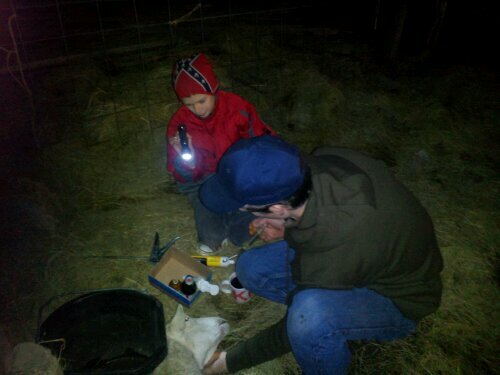 Then there were the times we had to pull lambs in the middle of arctic, freezing weather. 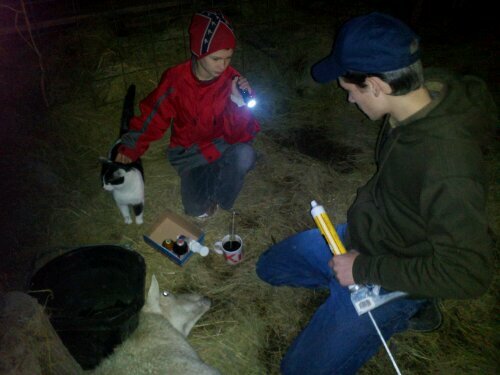 Then the time where the lamb was born on the coldest night of the year in an ice storm and froze. Then there is the most recent time where 3 very pregnant ewes drop dead within days of each other with no other obvious signs to go on. Farming is all fun and glorious to the one not living the reality. Farming is hard work. It is relentless and constant. It requires unbelievable concentration and care and worry. When the dog barks at night, you lay in bed wondering if the pig is out or if the “i-refuse-to-be-weaned-bull” broke through the fence and is drinking all your milk from your milk cow leaving you none in the morning. Or if the possums are stealing your eggs and decapitating your chickens. Or if you should get up and go outside with the shotgun just because something you never thought could happen is happening and you probably should know about it so you can add additional worry to your list of things to worry about next time the dog barks at night. Relentless, I say! Relentless!!! There are high highs and low lows. Birth and death are a part of the farming deal and you are required to deal with it often. Sometimes the lambs show up without incident over night, other times you are out in the barn or field at midnight trying to save your animal. That’s the raw deal, real life farm deal. I have thought about living in a sterile apartment in the middle of the city where my only plot of grass is the neatly trimmed wheat grass growing perfectly in the ceramic container sitting in my windowsill. That sounds appealing after freezing rains, the floods, the droughts… watching animals die… chasing your pig down the road on Sunday morning… leaving the water on and running your spring tank dry… shoving a water hose down your dairy cows throat because she broke into the barn and at a bag of corn… losing your garden to renegade animals who ate while you weren’t looking….coming home to find a chicken standing on your nice wool rug in your living room… I could go on but I digress. That sterile apartment would have never given me the trials and learning experiences and outlook on life that I have now. I may be way more pessimistic since moving to the farm, but allowing the trials of farm life to keep me humble has opened a door of perspective I never dreamed was there. So here we are this week, again enduring and dealing with unexplained down times and trials to the best of our ability. The boys started antibiotic shots, vitamin shots and a ridged schedule of dosing the 3rd ewe down with electrolytes and black strap molasses and some other supplements. 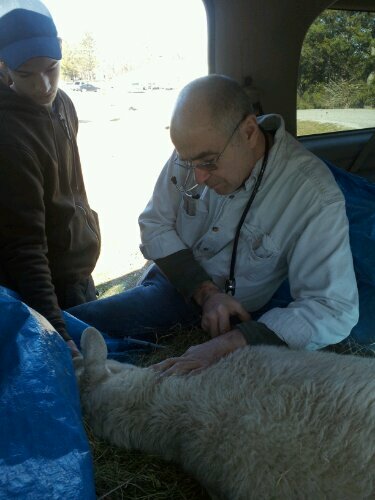 When she lasted longer than the other ewes, we loaded her up and took her to the vet to see what he said. After showing shepherd boy how you find a vein on a sheep to give IV fluid and letting him look at slides under the microscope back at the hospital, the doctor gave him further instructions on dosages and where to give additional shots. We were glad that the dosages and shots he was already giving her were right on target — thanks to a variety of sheep farm forums and The Merck Veterinary Manual we looked up on the internet. After all the instructions and not much hope, we drove back home and continued the 2 hour schedule. This cowboy country vet likes to see young kids involved in the care of their animals and is especially partial to kids who are serious about large farm animals. We thanked him for the great animal medical care training and the biology lesson! In the end, after all the intensive care…after all the shots and supplements, the ewe died as she was giving birth. Shepherd boy tried to help her deliver but in the end she was too weak to survive. Unfortunately, the lamb had already died before the birth. In all, 3 ewes and 5 lambs is a hard loss to swallow in one week. While we still are not exactly sure why we lost the ewes, we do know that it was some kind of toxemia. The Vet said his inkling is that something concentrated was in the hay or pasture that was toxic and that only these 3 sheep ate or quite possibly a case of toxemia of late pregnancy which is seen in ewes especially carrying twins and especially in the winter. Nothing changed so we haven’t quite figured it out yet and most likely will only be able to make guesses. At least we ruled out contagious disease. So while this week was hard— I hated to see my son struggle with such sudden and devastating loss. I hated to see him stay up late in the barn and wrestle with what to do and how to treat. I wanted to take all of that from him and insulate him from the trials of life. I wanted to make it easier for him. In the end, to realize that the way I make it easier is by offering my support and prayers while he wrestles and struggles and makes decisions about his sheep that he has invested so much time and effort and money into. After this experience, he is now considerably more keenly aware of watching out for signs that would signal trouble in his other pregnant and new momma ewes. I am most thankful for the amount of growth, knowledge and character he gained this week….That is priceless. Thankfully, two ewes gave birth the other night without any problems. For this we are very thankful and do not take the new life bouncing around in the field for granted! Here is our Sheep Journal with lots more stories about the sheep on our blog. This is a hard lesson even for us adults. We are in cold SE Wisconsin and we just lost a 6 month old colt for no apparent reason. This all while we ‘watch’ the jersey cow for calving and signs of milk fever. We marvel at the lessons we’ve learned, often the hard way, in the 4 years we’ve lived here. Yes, we do have some of those diseases….we looked into several of them but ruled them out. Most likely is toxemia of late pregnancy. We are taking measures to hopefully prevent that. Some of the things would be supplementing some minerals, adding some vitamin shots and probiotics, getting some alfalfa hay for the late pregnant ewes etc. instead of regular pasture and regular hay. Pregnancy in humans and in animals can be a very big drain on the momma… it is important to make sure those mommas have adequate supplementation expecially in the winter time and especially since they tend to have multiple births. Well done to your son for carrying on – my daughter has a small flock of sheep, it is great training.